A lady purchased a quantity of ribbons, and I asked what she was planning on doing with them. It turns out she makes hats! And what beauuuuutiful hats they are!!! 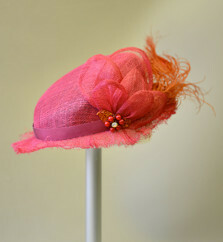 So I would really like to share with you the amazing creative work of this wonderful SELF-TAUGHT milliner, June Gumbel. I went to millinery school – this is hard work! And she’s totally self-taught, which just makes it even more amazing! So share the love and support small businesses, buy a hat!!! And, by the way, she’s also a really talented painter too! It seems to me, that countries/regions where meat has historically been plentiful and readily available to all (not just the wealthy), have generally evolved cuisines with dishes where a particular meat or cut is the star of the dish, while areas where meat is NOT plentiful and readily available have generally evolved cuisines that focus on sauces and vegetables, and the meat is somewhat interchangeable (or can even be left out). Fishing areas may have ready access to proteins, but they tend to fall into the second camp, as their dishes sometimes feature a particular fish, but are more often a dish where the varying catch-of-the-day can be tossed in. For example, Paella – catch of the day or any meat(s). Curries – any protein (including tofu). Coq au vin – chicken only. Beef wellington – beef. Etc etc etc.